February comes and goes quietly, as it likes to do. With static weather during the month, little has changed along the coastal patch, with Great Northern Divers still fishing off Rousse and Grandes Rocques, and up to three Med Gulls lingering along Cobo beach. A different male Black Redstart was seen at Grandes Rocques on 13th and the highlight of a drive to the west coast on 15th were 17 Lapwing. Yes, a very quiet month. A popular pastime amongst the local birders and photographers this month was watching Barn Owls feeding in the evening behind the driving range at Chouet. Two birds have been almost guaranteed there and have become quite used to observers, with some people getting some cracking photos. As it was over a year since I had seen the species, I made time for a couple of tries. The first, on 8th was not very successful with just a brief flying-away sighting, but on 15th a single bird appeared a few times quite close giving a great show, especially when fighting with a Kestrel. My camera skills do not extend to low-light photography. The last few days have seemed a little more summery and we are heartened by the thought that Wheatears will be perching on the coastal turf within two weeks. The local Marsh Harriers have been making very low passes over the house during the last week and bird song abounds. Breathe in the spring. 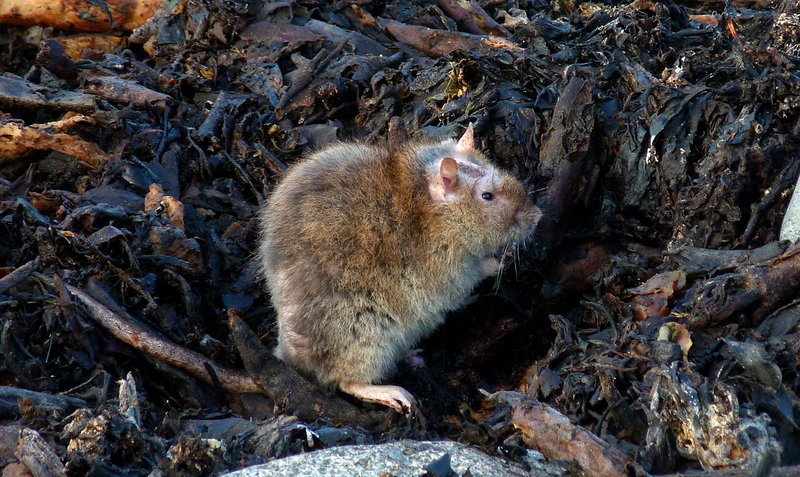 Rat - Pulias, 11 Feb 15 - a real monster, the size of a small cat, and with a thinning pate it seems. 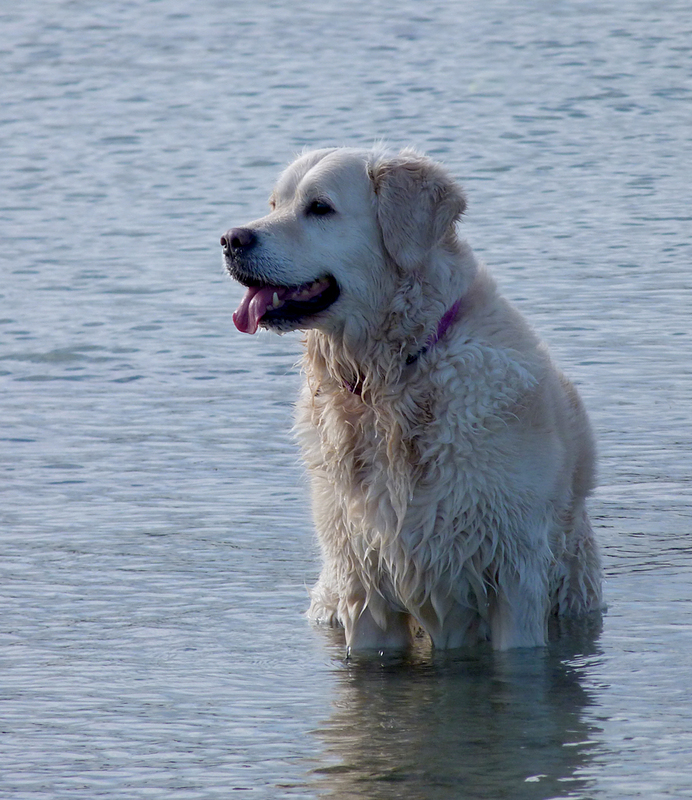 Finally some pictures of our Willow liking the water at Port Soif. A fresh year and a fresh birding outlook. After the last post of 2014 brimming with frustration, I have been pretty relaxed during this first month of 2015. I have not hardly been anywhere outside my coastal local patch and have been quite content pootling around these headlands and I have managed to get 60 species so far. New Year's Day was very pleasant birding around Pulias. The male Black Redstart was still there and still resplendent, and the waders were showing well on the beach, with around 40 Sanderling amongst the 100+ Ringed Plover and Dunlin. I couldn't find the Water Pipit which seems to have done a New Year flit, but there were two Great Northern Divers off Rousse headland. Technically the best bird was a Black-necked Grebe at Rousse on 9th, but not as satisfactory because someone else had already found it, although it was not a species I recorded on patch last year. There have been a few Golden Plovers in Pecqueries Bay during the last week of the month, and I found Great Northern Diver and Guillemot in Grandes Rocques Bay. By the end of the month at Pulias there were perhaps signs that spring was on its way back - the pair of Shelduck had taken up residence on the pond and there were suddenly about 100 Meadow Pipit feeding along the shore which were not there the day before. 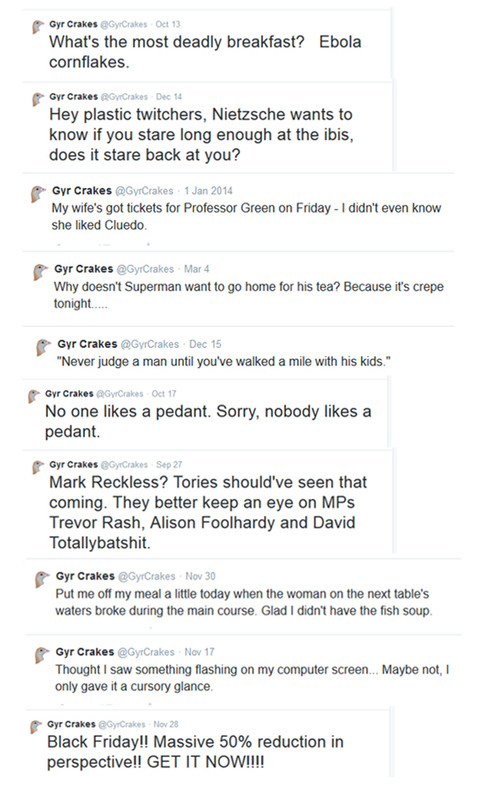 This has all been standard fare however and, to my eyes there has been no obvious arrivals for over a month now. 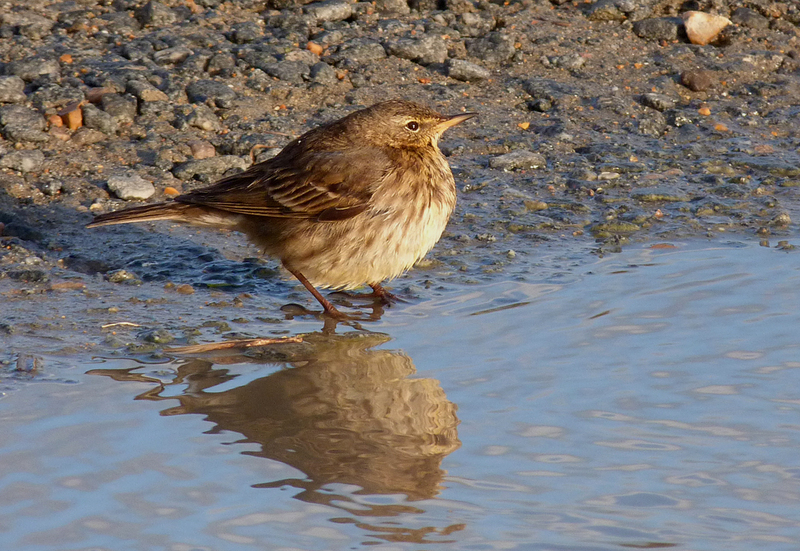 The winter birds are still pretty scarce and we are desperate for a cold snap to hit the UK or the continent soon. Just this week there has been snow in the UK and so perhaps this will push some birds south, but it seems that the south coast was not involved which may keep them there. 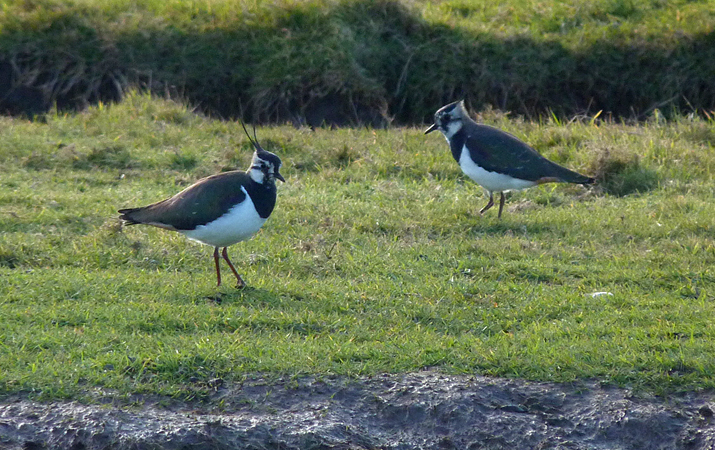 To me, one of the most exciting birding sights here on the island is watching Lapwing flocks suddenly appear in their hundreds as soon as the weather gets cold enough. I think that I've been worrying too much about only putting really good quality photos on this blog. It's been relatively easy to get good photos of plants and insects, but with birds it's bloody hard! Well, it isn't that hard if you are able to wait for good enough light conditions and have the time to stalk the birds properly. However, since I am restricted to 'rapid-fire birding' at the moment, I'm rarely in a superb photo-opportunity situation, so I am ending up taking hardly any bird photos and so having very few to put on here. So this year I am trying to take more 'everyday' shots of birds - like the two above - which may not be super-sharp, or frame-filling, or very well lit, but will at least show what I have been seeing, and give more of a feel of the year as it progresses. The main news this month is that we have a new addition to the family. Unfortunately, our wee dog Mr Pickles died during the month, but we have already got a replacement in "Willow". 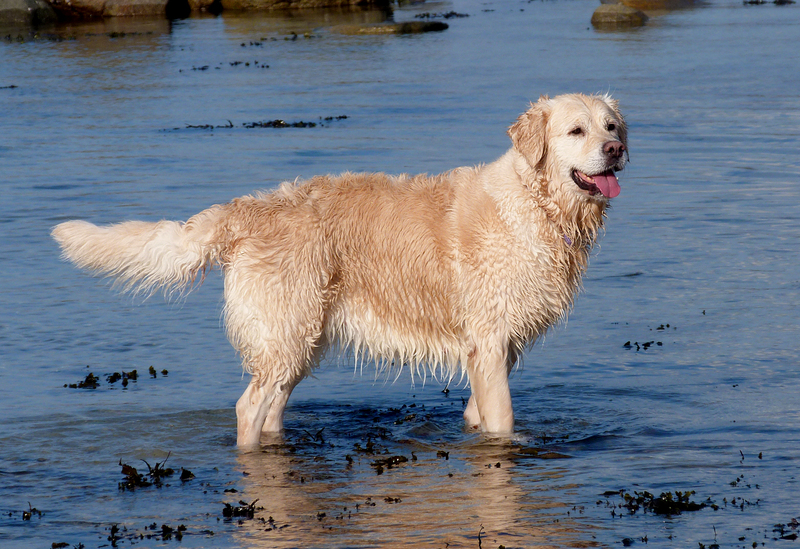 She is a very relaxed 5 year old Golden Retriever who needed re-homing, and all the family love her already. I did not manage to take as many photos during the last year compared with the previous year, so there was not as many pictures to choose from, but here are probably my favourite ten. They are not necessarily the best quality, or the most technically adept, but just the ones I liked the most and have a certain something that makes them interesting. 1. 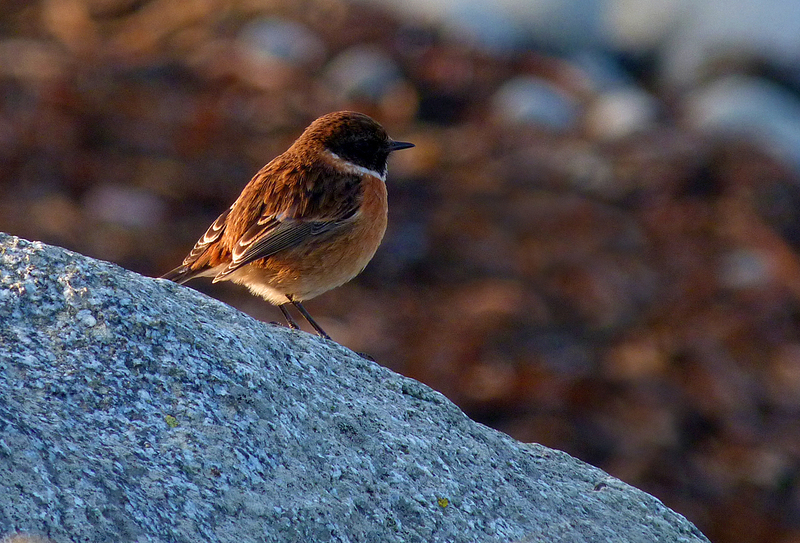 Female Stonechat, Fort Hommet, April. 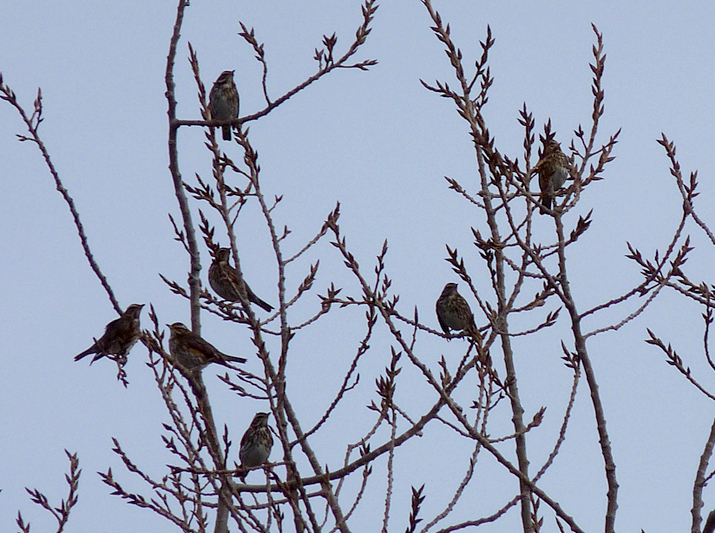 I hardly took any photos of birds locally last year. None of the rarer or uncommon birds played ball for me, and I didn't really have much time for the resident species. 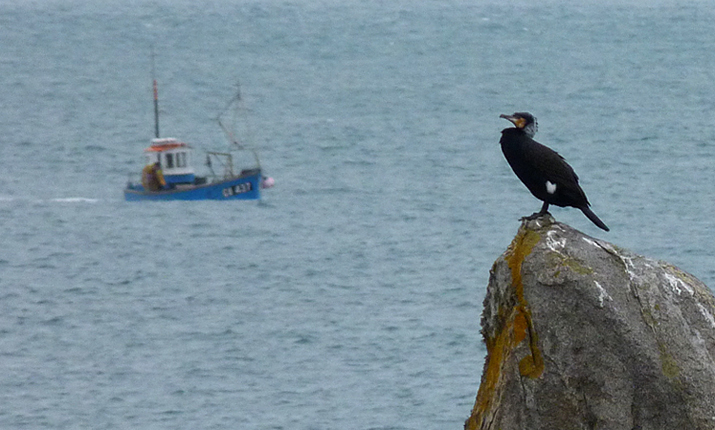 This was taken one lunch hour when I was unsuccessfully searching for migrants on the headland. 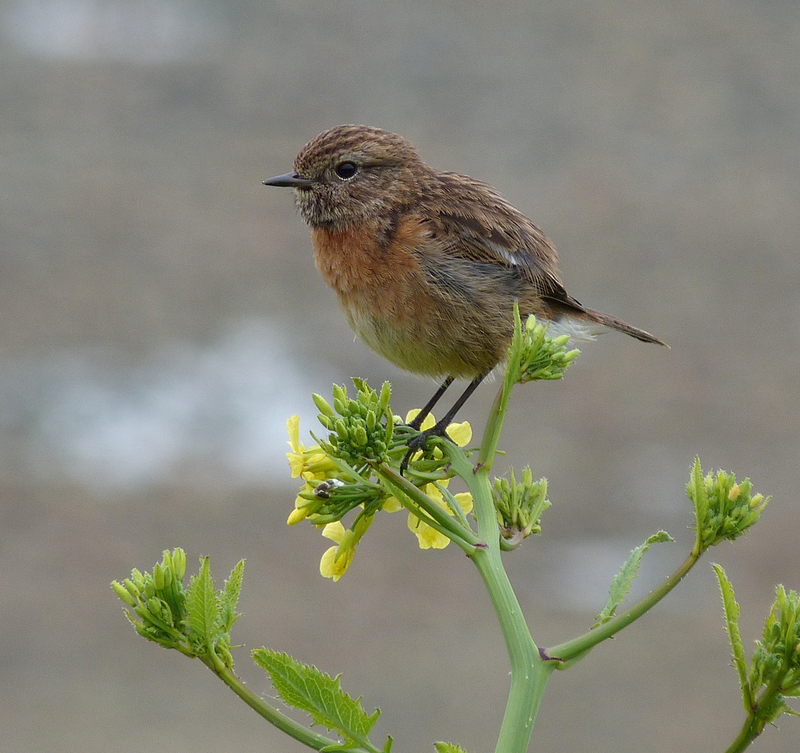 Getting decent photos of Stonechats is very easy here on the island, but this one was nice and straightforward - each part of the bird is pretty sharp, even each leaf of the Radish plant is in focus. The blurry background is nice and simple, getting away from the standard Stonechat against the sky shot. Nothing flashy, but I think this bird has perched in a pleasant pose and shows some character. 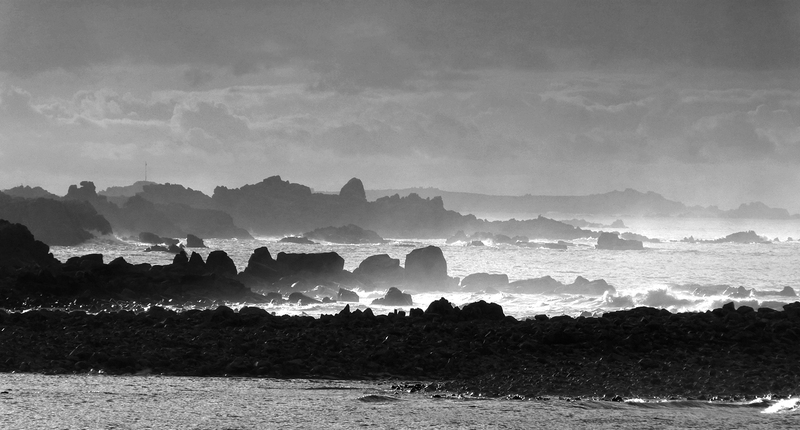 Driving back from work, late in the afternoon of a wild and windy day, I pulled into the top car park on the headland, and looked back west down the coast to see this view. 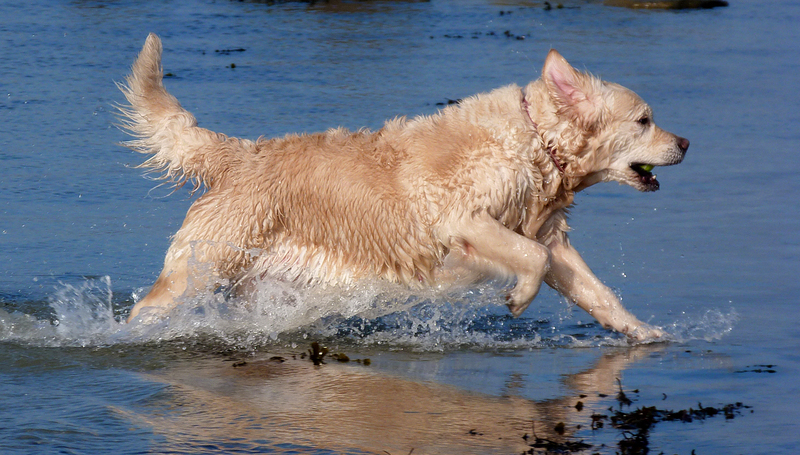 The waves were smashing in, producing lots of spray, which the wind was picking up and blowing into the coastline. This exagerrated the gradual fading of colour as the headlands became more distant. I also removed the colour which made the photo more dramatic. 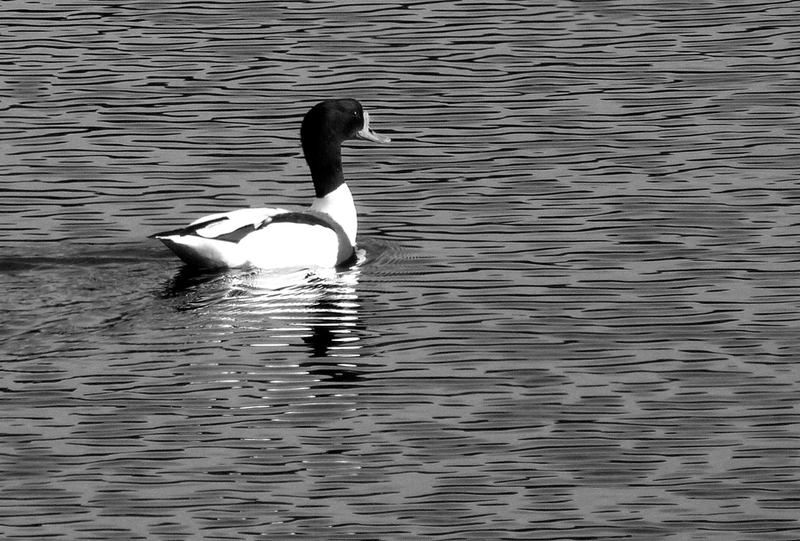 I so much love black and white photography more than colour. 3. 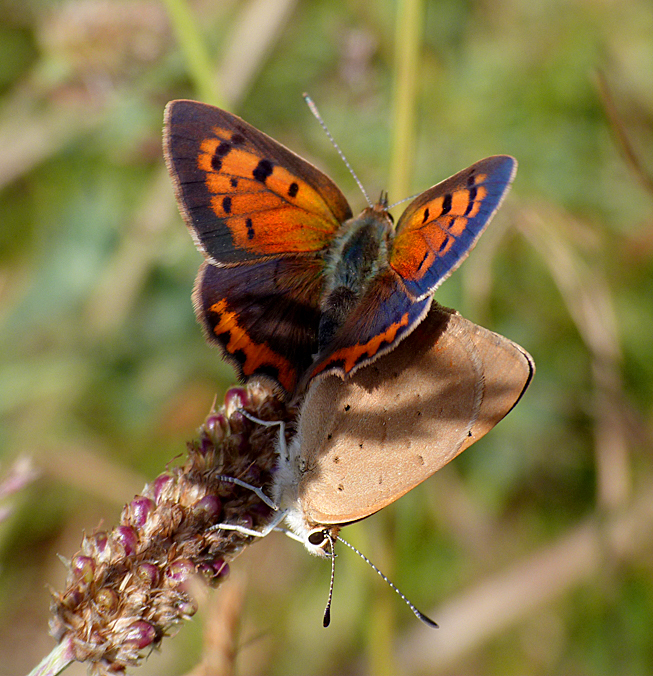 Small Coppers mating, L'Ancresse Common, July. I remember this being a baking hot day on the Common straight after work, and I was getting uncomfortably hot in my school-trousers whilst searching for beetles. I happened across this pair getting down to business and, although there is a slight lack of focus around the head of the top insect, the bottom one is crisp and sharp. The vivid orange of the upperwings stands out, but it is the subtle blue sheen to the wings, which is rarely seen and makes the photo more interesting. 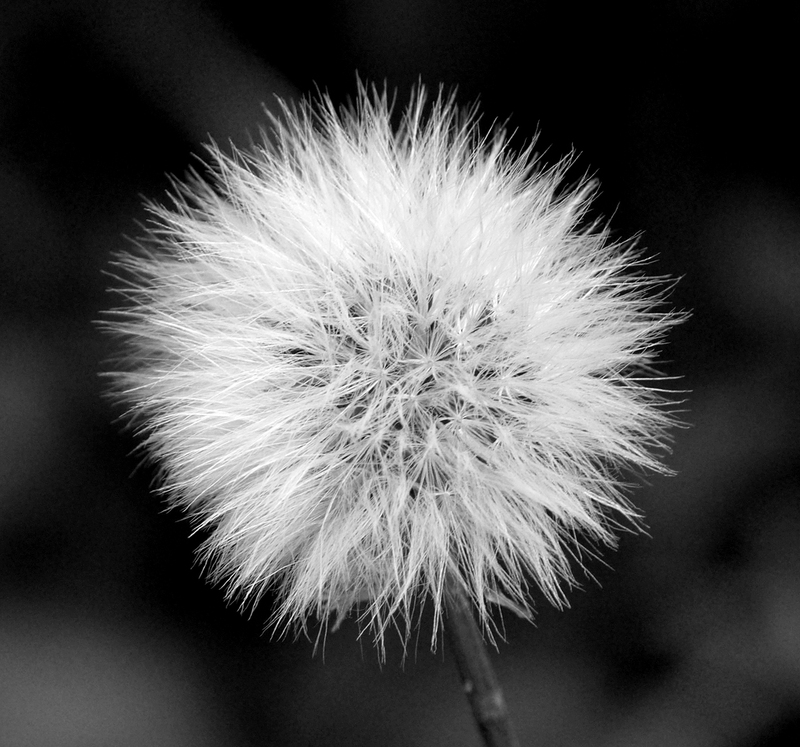 I don't know why, but I find this simple photo of a 'dandelion-clock' almost hypnotic. The background is not too dark, any darker would have messed the contrast up. Being a smaller sow-thistle rather than an actual dandelion, I was able to focus pretty well, even though it is a close up. Nothing complicated, just a snap of a weed outside our kitchen window, but it has a pleasing aesthetic to my eye. One of the most exciting activities in Iceland was hiking on a glacier. When I saw the glacier for the first time I was quite surprised that it wasn't a broken, white sheet of ice like the one I saw in France, but a grey, ashy, undulating glacier. 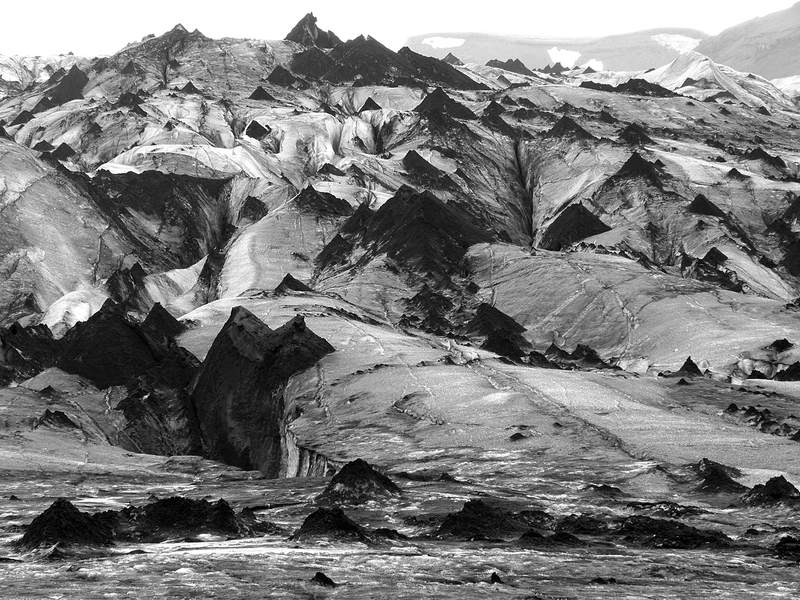 The volcanic ash causes these strange effects, especially these small black peaks sticking out above the ice surface. All these triangles appear to be poking up at exactly the same angle. This very unusual landscape looks like it could be a photo from a distant planet. Nothing complicated about this photo - just a simple portrait. Plain background and in focus, with a bright green diagonal stripe of colour from the grape vine. 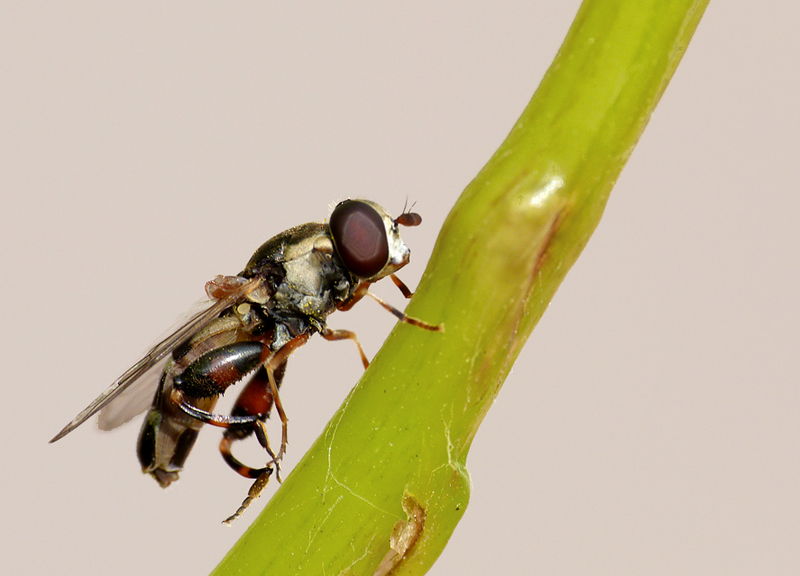 The hoverfly has an air of lightness about it as, if you look closely, it has its bottom three legs off the ground and barely looks like it is supporting itself. 7. Redwing, Thingvellir, Iceland, May. I found this Redwing nest right next to the walkway and you could get as close as you want to it, so I have lots of cracking full frame photos of the bird. However, pulling away a little meant that I managed this picture, which was easily my favourite of the set, much more pleasantly framed. 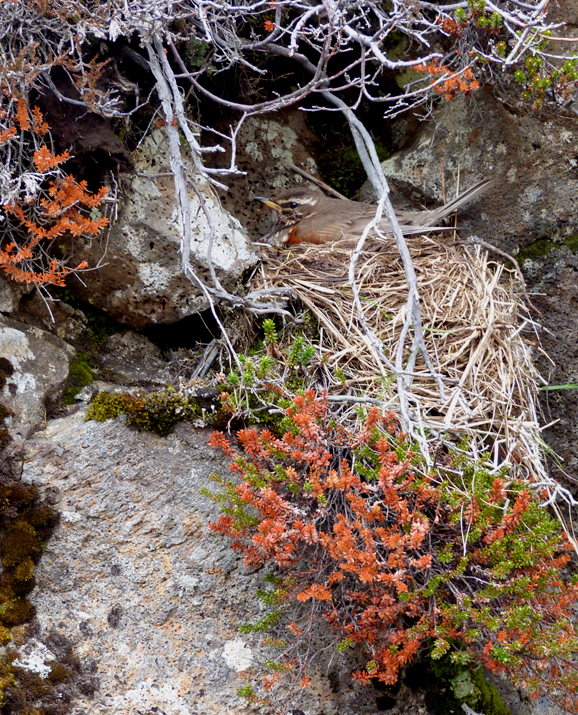 The bird is quietly incubating, and semi-camouflaged, her colours matching the surrounding habitat. There's little pockets of colour - reds, greens and the yellow of the bill. The photo shows the typical plants and rocks of the area, including the tiny 'bubbles' found in lava rock. 8. Dock Bug nymph, Grand Pre, July. I think the 'horns' on this tiny junior bug are terrific and more than make up for the blurring in the rest of the photo. 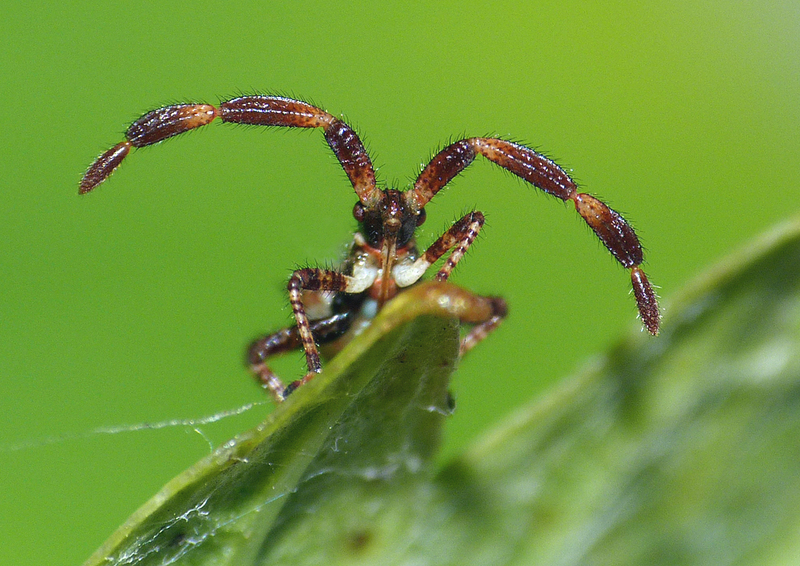 The antennae and the face are very well in focus and the background colour matches well. Makes a massive difference in a photo when you are looking up at an insect rather than looking down on it. 9. Golden Plover, Hafnarfjordur, Iceland, May. It was very early morning in Iceland when I walked from my hotel to the edge of town. 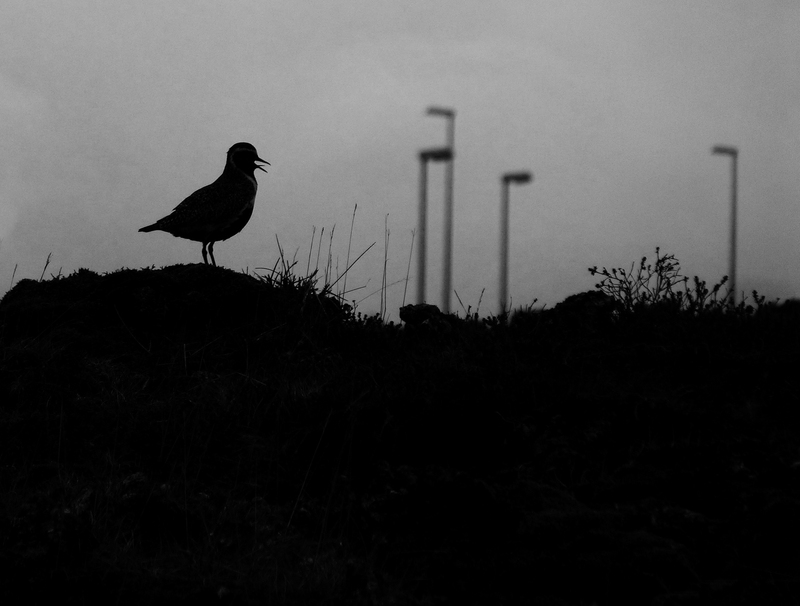 There were large numbers of Golden Plovers breeding right next to these suburbs but it was too dark to get a really terrific photo of one - well, too dark for my skills anyway. 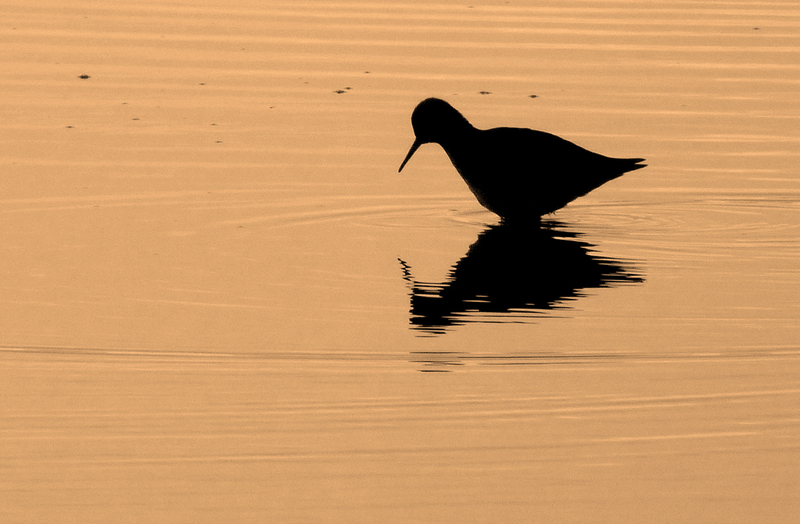 So I went for some silhouetted shots and was really pleased with this one. You can just see the white stripe on the bird and I love the way the tongue is sticking up. This could have been a picture of a Goldie on a remote upland hillside, but the distant lamp posts give it away as being close to an urban area, which gives the photo an interesting perspective. 10. 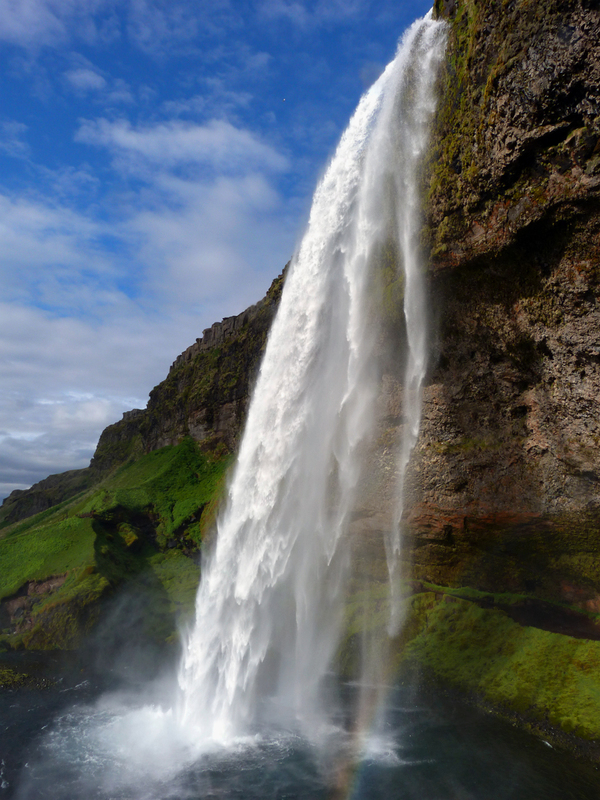 Seljalandsfoss waterfall, Iceland, May. Both my trips to Iceland were mostly cloudy, and one of the few times the sun came out was when we visited this fabulous waterfall one afternoon. I only just managed to get the whole waterfall in the frame by pushing myself back against the rocks. The blue sky, the green vegetation, the white water and the rainbow in the spray all combine to make a magnificent and memorable scene. As can be seen looking at the timeline, I decided I needed to take a little break from updating this diary, hence this is the first entry for a couple of months. This is partly due to having less time available sat at the computer. I used to just be able to keep the computer on all weekend in the kitchen and dip in and out of it whenever I wanted. However, now the family are getting older and all three kids like to go online to do their 'thing', we have to share out our computer-time. I suppose we could get the kids their own computers but we prefer them to stick to ours so that we can keep an eye on what they're doing. Also, this term has probably been the busiest I can ever remember being at work. Expectations about what is required to do the job seem to have been ramped up somewhat, meaning less spare time tapping away in the evenings. I'm sure I'll get used to this pretty soon, and be able to be more efficient, but I definitely won't be able to produce as much as I used to, and will have to cut down. Anyway, the words I have been typing seem to be getting a little repetitive - "I've seen nothing new/exciting/different/interesting" - but it has indeed been true. Living on an island, if you get into a birding slump, you really do get into one. If I was in the UK and I hadn't seen anything for a while in and around my local area, then it's easy to get a quick fix - a trip to somewhere new, or just go on a jolly twitch - but here it's just a case of waiting it out. Don't get me wrong, this is not moaning, and I am carrying on regardless. I love my birding more than ever, and every time I step out with my bins around my neck I still get the same buzz as always. 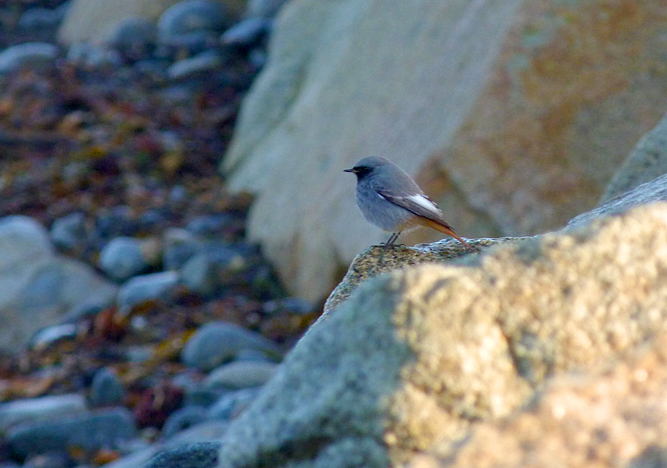 One of the best birds I've been seeing regularly was the above male Black Redstart that has been present on the beach at Pulias since 12th Nov. One of the brightest individuals I have seen of this species, the photo does not do it justice. Also on the same beach there is a female bird and a Water Pipit has been there throughout the last two months of the year. Other good birds on the 'patch' have been two different Common Gulls, a Great Northern Diver off Rousse, a briefly-seen, from-the-car Little Grebe on Pulias Pond, and a late Wheatear at Rousse on 13th Nov. Any time I have birded off-patch during this time I have seen very little new, but a stroll along Havelet one weekend revealed a probably wintering Common Sandpiper on the rocks there (15th Nov). So with the above-mentioned species adding points to my total, my "Patchwork Challenge" for 2014 has been pretty successful, in that I reached exactly 100% of my target points score of 143 for my chosen patch of "Hommet to Rousse". 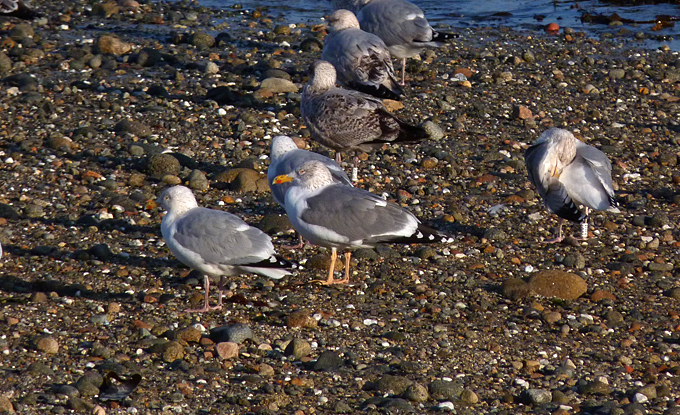 I thought I was going to fall slightly short but a Yellow-legged Gull on the beach opposite the Peninsula Hotel on 29th Dec brought me the 2 points I needed. At least I have a nice definite target to chip away at in 2015. 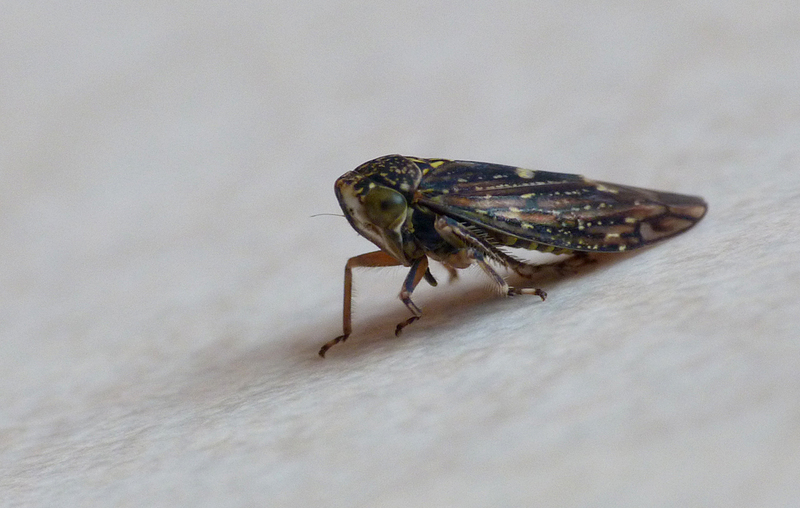 Acericerus heydenii - garden, 22 Dec 14 - As one might expect in these cold wintery months, my invertebrate-finding has been put on hold somewhat, but this leafhopper was on the car windscreen one afternoon, and I think may be a new species for Guernsey. As I have mentioned (one or two times!) recently, local birding appears to be going through a bit of a slump, and other birders have also commented about this. But is this slump real? Does it just feel like I am seeing less, or am I actually seeing less? Does the data back up this feeling? Well, I am not going to analyse all the island's database for signs of a decline, but I can easily look through my recent years' sightings. 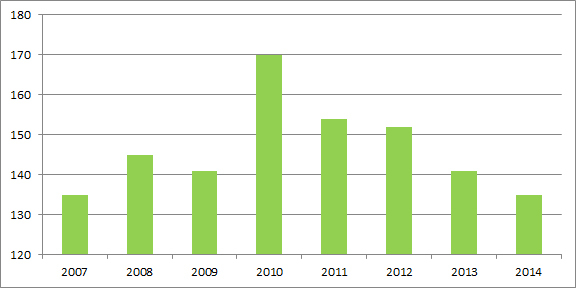 The first graph below (green) shows my island year list totals for the last eight years. From 2010, there seems to have been a gradual decline in the number of species seen. I estimate that I have spent about an equal effort birding during these five years. However, perhaps I have been visiting less varied sites and been sticking to patch more often? This would result in less of a variety of birds seen. 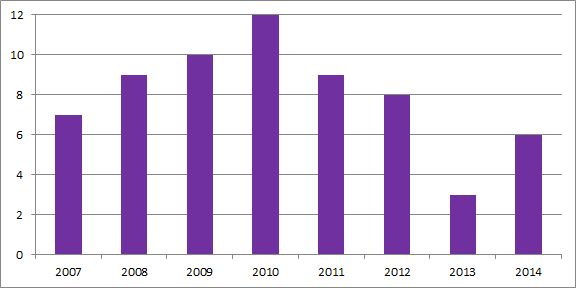 The next graph (purple) shows the number of "official rarities" that I have seen during the last 8 years. Although this depends a lot on where the birds turned up and when, there still seems to have been a decline in the number of quality rarities I have been seeing. 2014's birds were Glauc and Iceland, Stilt, R-l Buzzard, R-c Starling and R-b Fly - not a super-quality list and the last 3 were seen very poorly and barely count! The next graph (blue) shows how many full-blown Guernsey ticks I have had in each year. This clearly has been awful in the last two years. However, this cannot be too reliable, as due to the law of diminishing returns, this is bound to fall as you see more things. But there is still plenty I still need for Guernsey and so it shouldn't be quite this bad! The final graph (rufous/maroon) may be a better measure than actual ticks - it is the number of birds that I have only one record of in my time in Guernsey. This may be two birds, or a bird that came back the next year, but basically only one-offs. This still shows a decline in very recent years, but when you look right back to 1998, there used to be only an average of 2 'one-offs' each year anyway. Taking this into account, maybe there is not a big slump in good-quality rarities. Maybe we were spoilt a bit in 2008-2009. So looking at this very unscientific analysis, there does seem to be a general decline over the last 4 or 5 years in rare and uncommon species being seen in the island. 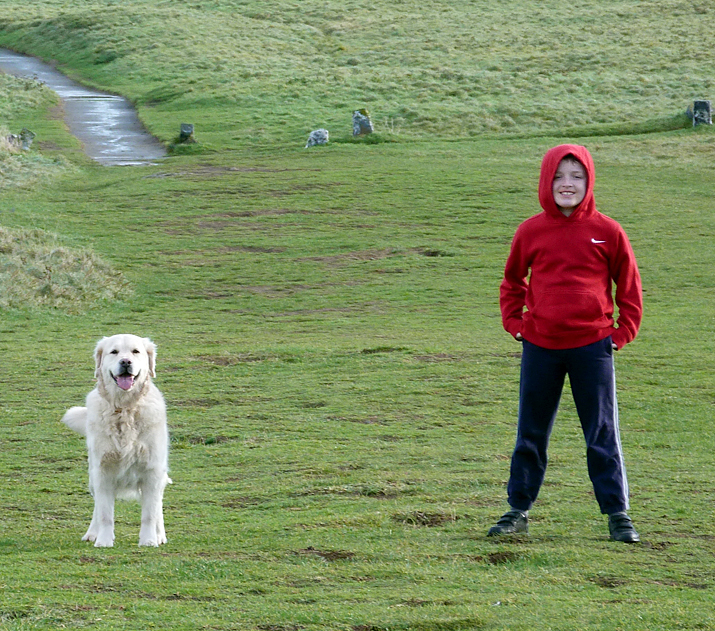 Previous to 2010 my birding was more hit and miss due to the kids being very small, but it has been more constant since. 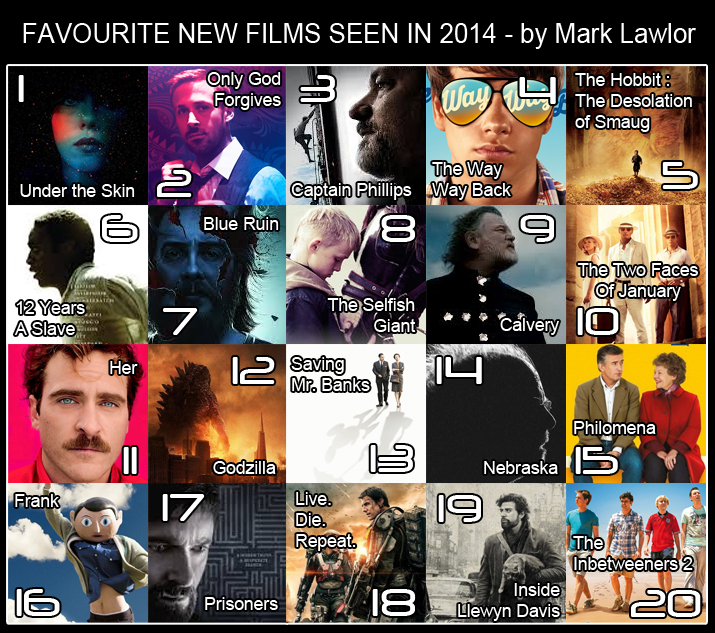 What is very clear is that 2013 and 2014 were totally pants and I pray that 2015 is better. Well, I'm still gonna give it some welly anyway!